The 42nd Annual Sudbury Masters/Continental Insulation Ramsey Tour took place on Sunday, September 9 with close to 140 participants. Once again we had excellent weather resulting in some very good times. You can see all of the results by going to the Sudbury Rocks website. I would like to thank all of the volunteers who helped make the event a success. Without the volunteers and also our sponsors, especially our title sponsor, Continental Insulation, we would not be able to host the race. Thanks to all of those who participated and we hope to see everyone next year for the 43rd Annual Ramsey Tour. Please note the Course and LU Records listed are only as of 2003. As you heard today, the race has been hosted for 42 years but I don't have results from the earlier days! That being said, Jenny B ran the 3rd fastest time by an LU female athlete since 2003 and Paul S ran the fastest time by an LU Male since we started the program back up in 2015 and his time is the 2nd fastest on the course since 2003. Mind you, being back in his hometown (London) all summer long did carry some benefits when it came to his training program in preparation for year two of OCAA competition. “I am in a little bit of a lucky situation, because I train the runners at the Running Room (back home), so my work was in the store, as well as on the track,” said Mundt. “I think I ran cross-country in grade nine, but after that, I kind of ran recreationally every once in a while,” noted the third year nursing student. 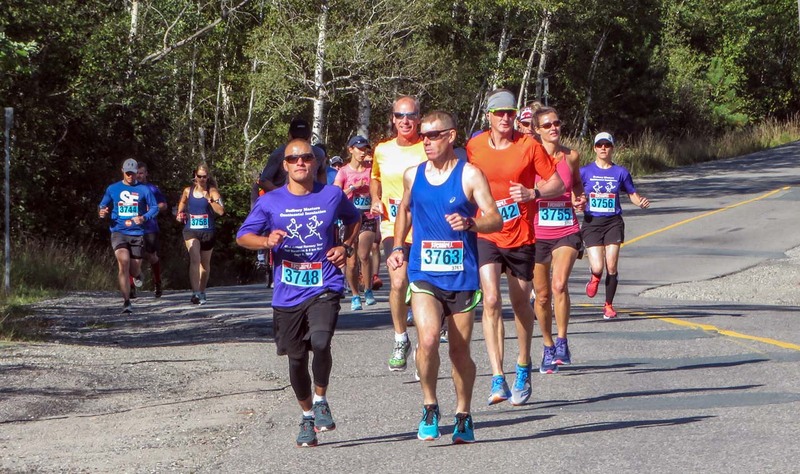 “It's never been a competitive sport for me, but I've always enjoyed running.” In fact, unlike other relative newcomers to the sport, Ricci has no issue with the longer distances, having tackled the half-marathon at the Sudbury Rocks race back in May. Sidelined at the moment with a lower back injury, 25 year old Kevin Jeanveau understands exactly where Ricci is coming from, as he steps in as a quasi “assistant coach” while healing, looking to hopefully return to competition either this year or next. “Eric (Leishman) and the coaches last year were a huge part of my growth as a competitive runner, so I would like to give that back to everyone.” The Golden Shield cross-country crew will kick off the college season, in earnest, next weekend, travelling to London for the Fanshawe Invitational. Just four years into the re-launch of the men's varsity cross-country program at Laurentian University, the Voyageurs appear poised to leap forward. "Ever since I arrived here, our goal has been to get to nationals as a team," noted Kingston native Paul Sagriff, not long after finishing second overall in the Ramsey Tour 5 km, trailing only race winner Eric Leishman (15:27) with a rock solid time of 15:36. "That's the number one goal. Everyone just stay healthy, make sure the training is going well, and run well at OUA and qualify as a team." The reason for Sagriff's current optimism goes well beyond in own performance last Sunday morning in Sudbury. Laurentian racers would secure spots two through five in the finish, demonstrating some depth with teammates in eighth, 11th, 17th and 18th. "Our top four were all really close to each other, within 25 seconds or so," noted Sagriff. In fact, Liam Passi (15:49), Eric Gareau (16:02) and Caleb Beland (16:05) all crossed the finish line before Sagriff had much of an opportunity to catch but a breath or two after his dash. Entering his second year with the team, Sagriff is understandably anxious to get into the meat of the team's fall schedule. "The training went well this summer," he said. "I was injured for most of the winter season. May and June were just about getting back into it, in July and August the mileage went up, and I've been feeling good. The body has been feeling good." "I wasn't expecting to run this well today," Sagriff suggested. "I think having Eric Leishman pushing the pace really helped the result, so I'm happy with that. He was checking his splits on his watch. I think at 3 kms, he said we were through in 9:11, so I knew we were moving pretty well and I just wanted to hang on as long as I can and see how I do." That type of friendly competitive banter between a varsity runner at Laurentian and the cross-country coach at Cambrian College is somewhat emblematic of events hosted in these parts. It's just part of the reason why Track North Athletic Club alumnus and long-time Nipissing Lakers varsity coach Donna Mae Robins keeps coming back, year after year. 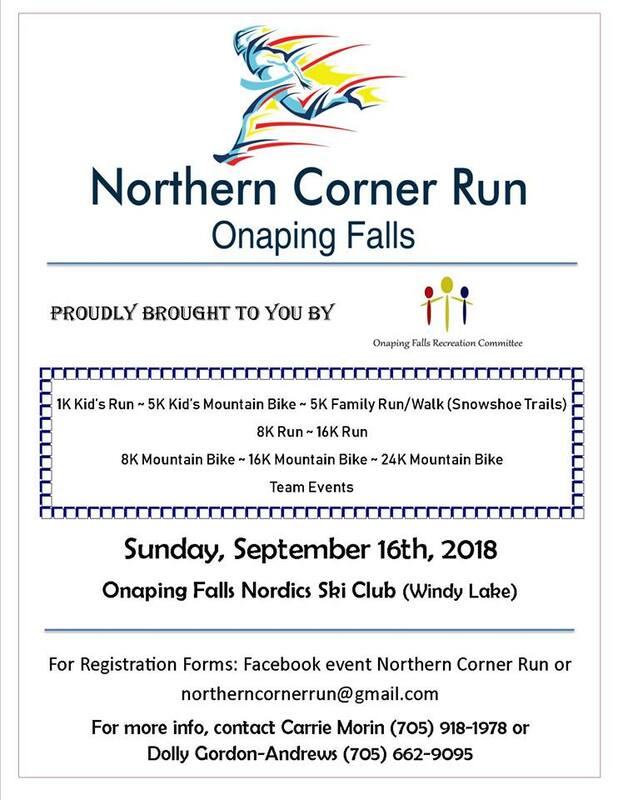 "We compete against each other, but we really are something of a northern running community," said Robins, who at age 41, posted the third fastest women's time in the 5 km, covering the traditional course in a time of 19:27. "It wasn't a bad race," she said. "I've had better, but I'm also not getting any younger." Having played a little soccer in her youth and competing in the cross-country circuit while in high-school, Robins really gravitated to the sport during her post-secondary days in St Catharines, studying at Brock University. "My first year was a learning process, moving away from home, but also getting involved with the whole running community down there," she recalled. "There was a track team there too, so I ran with them in the winter." "When I finished university, I just stuck with it, and after a couple of years, I started coaching at Nipissing, and I've been doing it since 2003." This year, however, she would have her attention divided, providing support both for the contingent of Lakers' athletes, but also keeping an eye on the progress of her son, Emmitt Reid. The Sudbury CIBC Run for the Cure kicked off at longtime fundraising supporter Cambrian Ford today with a huge announcement, followed by a list of speakers whose lives have been touched by breast cancer. From now until 11:59 p.m. Pacific Standard Time on Sept. 13, 2018, every donation in support of the CIBC Run for the Cure will be matched by CIBC, dollar for dollar, up to $500,000. Robert Giroux, general manager of CIBC at Southridge Mall said that donation matching and raising funds for the Run is a great way to give back. The enthusiasm with which CIBC employees participate has been inspiring. "It's something that, if you go into any of our banking centres — you'll see they are decorated, we have fundraisers going on, that the Run is well-supported," Giroux said. Not only will branch staff encourage members of the public to participate in the Sept. 30 event, they will create their own teams to raise funds beyond the working week. In 2017, 15,000 Team CIBC members volunteered, walked, ran and raised more than $3 million in support of breast cancer research, contributing to a total of $17 million raised by run participants across Canada last year. According the event website, the CIBC Run for the Cure began as a joint initiative between CIBC and the Canadian Breast Cancer Foundation (CBCF). Last year, CBCF and the Canadian Cancer Society (CCS) joined forces under the CCS banner. "We're very excited about the announcement that was made today by the CIBC and we look forward to anyone that will be making a donation online, to do it in the next two days," said Cathy Keaney-Burns, senior manager at the Canadian Cancer Society Sudbury and Sault Ste. Marie office about the CIBC pledge to match online donations today and tomorrow. Above and beyond the contributions made to support breast cancer research, health education and advocacy programs, the Run has also become an opportunity for cancer patients to connect with one another and to those who are committed to the cause. Pam Pancel is one of those people who made a connection through the fundraiser. This year will be her 19th year of participating. Pancel ran for the first time back in 1999 with her dear friend, Myra. Less than a year after the two first participated in the run, Myra was diagnosed with breast cancer. They continued to run on the same team. Since her passing in 2011, Myra's helpful, encouraging and strong spirit has been remembered in the determination award that is given out each year. "Myra was such an advocate. She was just strong. Like Pam, she was able to see the funny things," said former run director, committee member, and breast cancer survivor Stephanie Koett at the launch. For her, research, prevention and education are important goals to strive toward; more important than that, is a cancer patient's need to connect with people who care or are experiencing similiar challenges — as survivors and as family members and friends. "It's important to look at it from the support perspective. We need to have support and to accept the support we have," said Stephanie Koett, a former run director, committee member, and breast cancer survivor. "People like Pam, people like my husband, there's no words to describe what they did for us." Koett and Pancel were actually unknown to each other until they met at a Run one year. "Ever since then, if I need something, I can reach out for her and vice versa," Koett said. "No one should be alone going through treatment, and through cancer and breast cancer." The 2018 CIBC Run for the Cure takes place on Sept. 30 at Cambrian College, with registration beginning at 8 a.m. and the run starting at 10 a.m.
Visit the CIBC Run for the Cure website or call 1-888-939-3333 for more information. I have registered Sudbury Rocks!! Running Club as a team for Run for the Cure. Please join my team and tell your friends and family. Steve Gathje, 63, didn’t run on July 27 for the first time in almost 17,000 days. If not for his high school football coach, Steve Gathje, now 63, might never have become a runner. That would have made the next several decades unfold quite a bit differently: Beginning when he was 17 years old, Gatje ran at least one mile every day—and kept that up for just shy of 45 years and 10 months. Then, on July 27, he left his running shoes at the door, ending the fifth-longest run streak in American history. Entering Lourdes High School in Rochester, Minnesota, in 1969, the only sport for Gathje was football, despite his wiry frame. But when his coach told everyone on the team they had to run track to stay in shape, “I decided this was a whole lot more fun than sitting on the bench in football,” Gathje says. Inspired by his new coach and the pages of Runner’s World, Gathje went on to represent Minnesota’s Saint John’s University at Division III national meets. He studied to become an actuary, the beginning of a 40-year career in the field, and continued to race. In 20 years of racing, he’s finished more than a dozen marathons, with a PR of 2:27:30, plus countless other shorter distances. During his run streak, Gathje averaged around seven miles a day, and settled for one mile only 10 times. He ran the day before marathons, after marathons, his wedding, the birth of every one of his four children, when he flew to Hawaii for vacation and to Europe on business. Once, when stranded in Newark’s airport because of a canceled flight, he got his mileage in by doing laps in the parking lot. “I just thought, hey, that’s pretty cool. I can’t stop now,” he says. And that attitude never wavered. Despite the streak, Gathje strove to keep running on the periphery of his life. Most of his runs took place before the world was awake. For a while, he ran his commute, slotting it into his existing schedule. The amount of discipline needed to continue a 45-year streak is immense, but Gathje insists that after a while, it just became automatic. Plus, his “numerically-inclined” career contributed a lot, too. He dutifully recorded details of every run in notebooks, then transitioned to spreadsheets when computers arrived. The level of analysis he’s reached is incredible: With a few clicks, he can find any arcane statistic imaginable, like his 20th-fastest 30-mile week. But despite being a number’s guy, Gathje was never sucked into tech’s intersection with running. He has no idea what Strava is—the running world’s loss, because what a profile that would be—and he just recently bought a Garmin smartwatch, whose data went straight to his spreadsheet after each run. But he didn’t have much time to enjoy that automatic input. Soon after, Gathje knew it was time for his running streak to come to an end. The osteoarthritis he’d been dealing with in his right hip—which had been bothering him for six months—grew worse. In fact, he’s due for a hip replacement soon. And while it has been difficult to put aside his running shoes, he’d do it all again without a second thought. Support Colours of Hope 5K Sudbury! Add a splash of colours to your running calendar with the Canadian Cancer Society's Colours of Hope 5K at KIVI PARK! You'll be transformed in more ways than one during this non-competitive, fun-filled event which celebrates life and raises important funds to fight cancer. When it's over, the colour will wash away, but your smile is there to stay. Register to begin fundraising online for the Canadian Cancer Society's Colours of Hope 5K. 5k : Sunday September 23, 2018 @ 9:00 A.M.
10k : Sunday September 23, 2018 @ 8:30 A.M.
Half Marathon : Sunday September 23, 2018 @ 8:00 A.M.
We invite you to run or walk with us on Sunday, September 30, 2018 for the CIBC Run for the Cure in Sudbury. Whether it’s your first time, or you’ve participated for years, we look forward to having you join the movement! Help make this year’s event inspirational and memorable, all while you help the Canadian Cancer Society create a future without breast cancer. Cambrian College, 1400 Barry Downe Rd.